A reasonable attempt at illustrating the larger sized English ships and therefore their crew’s advantage in battle. Alfred responded to the threat by constructing a fleet of large longboats, each of which could carry a hundred men, to meet and fight off the invaders before they landed. This navy’s first battle was against four Danish ships in the Stour Estuary in 882, but it was his victory over the invading forces in the Thames estuary and off the coast of Essex in 897 that won Alfred the epithet ‘the Great’. King Alfred is now considered to be, in a way, the founder of the Royal Navy. The treaty with Guthrum gave Alfred the breathing space he needed to fortify and revitalize Wessex. As the last outpost of independent England, it was essential for Wessex to have an efficient military. Throughout his realm, Alfred built strongholds known in Anglo-Saxon as burhs (the origin of the modern English word "borough"). Each held a garrison of about 160 men, plus an undetermined number of servants to do all the cooking, cleaning, and tending of horses. Traditionally the English army moved on foot, but Alfred realized that given the speed with which the Vikings struck English targets, the English must be able to respond quickly, too. The burh garrisons, therefore, were all cavalrymen. For the same reason, the king established his burhs in close proximity—none was more than 20 miles away from another. Alfred also reorganized Wessex's army, keeping half of the men on duty at any given time. And although Alfred is famous as the father of the English Navy, kings before Alfred had used war ships. Nonetheless, recognizing that swift ships were just one more advantage the Vikings held over the English, Alfred brought over from Frisia (modern-day Holland) skilled shipwrights to build his new navy. Responding to the sad state of religious and intellectual life in England, Alfred refounded ruined abbeys and convents, brought over learned monks from France to reestablish schools, and set the example for the revival of literacy in the land by personally translating religious and secular books from Latin into English. Guthrum gave Alfred seven years to rebuild his kingdom, but then the double-dealing Viking broke the treaty and invaded Wessex in 885 and laid siege to Rochester. But Alfred's new military defensive measures worked. Mobilizing his standing army, his burh garrisons, and his navy, he broke the Danish siege easily, then sent his fleet up the River Thames to capture London. In 886, after seventeen years of occupation under the Vikings, London was in English hands again. Alfred pressed his advantage by requiring, in a new treaty with Guthrum, that English Christians under Viking rule in the Danelaw enjoy the same legal protections as the settlers from Scandinavia; beaten and humiliated, Guthrum agreed. Four years later, Guthrum, apparently without giving Alfred any more trouble, died in Hadleigh. In spite of Guthrum's defeat and death, the Vikings continued to mount sporadic raids on Alfred's territory. But a serious invasion with eighty ships was mounted from France in 892, led by a Viking chief named Hastein who had been terrorizing the inhabitants of the Loire Valley. He ordered part of his force to disembark in Kent, then beached his ships at Benfleet in Essex. Danes from East Anglia and York joined Hastein's army, but once again Alfred's military proved its worth. The infantry harried the Vikings, while Alfred's navy destroyed many of Hastein's long ships in a battle off the coast of Devon in 893. After several more reverses on land, Hastein and most of his army retreated up the old Roman road, Wading Street, to Chester. Bad luck pursued Hastein's army for another three years. The Vikings abandoned Chester in 894 and invaded northern Wales, but the ferocious resistance of the Welshmen and the lack of supplies forced the Vikings to retreat. The next year they attempted to establish a base on the River Lea north of London, no doubt positioning themselves to take the city back from Alfred, but the English hit them so hard that the Vikings had to retreat for safety into the Danelaw, leaving their dragon ships behind. In 896, the Vikings were encamped along the Severn when Alfred attacked again. The Vikings scattered: Some went north to York, and others sailed back to France in hope of easier plunder. As the sole English king of the old stock, Alfred became an inspiration and arguably even a rallying point for the English, especially for the English in the Danelaw. He had come back strongly from almost certain annihilation, smashed his enemies, reclaimed his kingdom, and made that kingdom so strong it could drive off or defeat every Viking invasion for the rest of his life. But Alfred also realized that there was more to a nation than military strength. So he revived learning and literature, reformed the English legal code, founded new monasteries to replace the ones destroyed by the Vikings, and brought over monks from the Continent to get the new communities off to a strong start. Rarely has a country teetered so closely on the brink of destruction than did England in 878. Rarer still has it fallen to one man to bring his nation back from near-disaster. Yet that was the destiny of King Alfred; without him, England as we know it would not exist. Michael of Rhodes is certainly not the most popular of fifteenth-century writers. 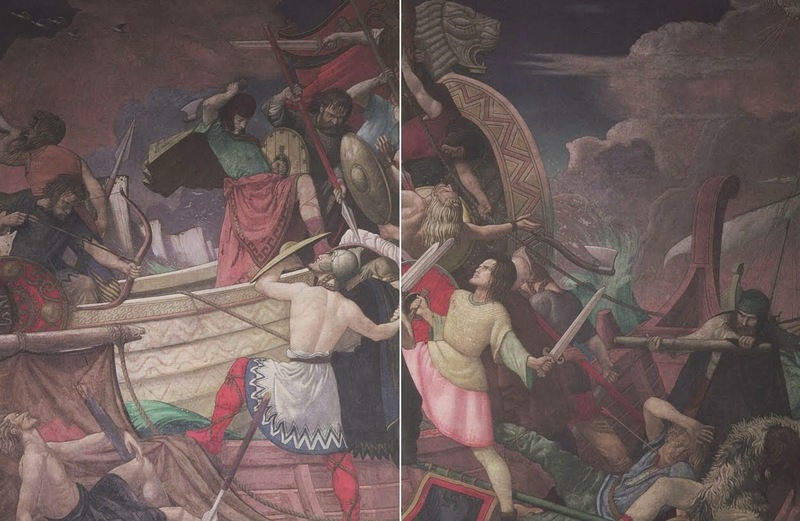 A Greek émigré who moved to Venice in 1401 as a humble oarsman, fought several sea battles, and managed to advance to the highest ranks in the Venetian navy, "only with difficulty could [he] be considered an intellectual" (vol. 3, p. 101). Yet the manuscript this "adoptive hero" of the Serenissima started to compose in 1434 (probably as a way to advance in his career) represents a true treasure of information for early Renaissance scholars and, more generally, for historians of early modern science and technology. A 241-folio quarto manuscript, the "Book of Michael of Rhodes" includes treatises and practical exercises in commercial mathematics, a beautifully illuminated section on astrology, extended notes on time reckoning, and a rare portolan, Greek prayers transliterated in Latin characters, officers' rules, and nothing less than the world's first extant treatise on shipbuilding. The manuscript, which is being published for the first time, marries medieval encyclopaedism with early fifteenth-century technical knowledge, late Byzantine religious beliefs with Venetian culture, and science and art with everyday practice. Its varied, if not eclectic, character is enough to make Michael's manuscript a unique object of study. The history of the manuscript is itself interesting. It is a saga no less compelling than the adventurous life of its author. Parts of Michael's book were known in seventeenth-century Italy, but since then the manuscript had been deemed lost, until it "miraculously" surfaced in 1966 at a Sothebys auction. Purchased privately, it once again vanished from the scene, until it suddenly reappeared on auction almost forty years later. Conscious of its historical value, this time the new owner not only gave scholars full access to the manuscript but also allowed its integral reproduction--hence this MIT facsimile edition. The Book of Michael of Rhodes is a lovely three-volume hardcover set. The first volume is a faithfully reproduced facsimile of the actual manuscript and other original documents related to the life of Michael (including his and his wife's wills). All the folia (comprising a vast number of blank ones) are entirely reproduced in color on glossy paper in the same size as the original, making visible different types of ink, margin lines, water stains, and the various marks of time. The quality of the reprint makes it possible to read the original text and fully appreciate the wonderful illuminations in their brilliant colors. The second volume contains the transcription of the manuscript faced by the English translation on the left page, in order to facilitate comparison and assist readers unfamiliar with medieval Venetian. The text is complemented by comprehensive indexes of Venetian general and proper names and of their respective translations, which makes the volume easier to navigate. The third volume comprises studies of the manuscript by nine international experts in different aspects of the early Renaissance, including a paleographer, a mathematician, an art historian specializing in medieval astrological imagery, a historian of Venetian cartography, historians of science and medicine, and an expert in medieval ship construction. A companion to the facsimile edition, this last volume is meant to investigate and contextualize the figure of Michael of Rhodes and different aspects of his work and make the manuscript "more comprehensible and accessible" to scholars and the general public (vol. 3, p. ix). Pamela O. Long's detailed introductory chapter certainly fulfills both goals. Here, the coeditor effectively sets the manuscript and its author within the broader context of nautical writing and the Venetian maritime world. Long lucidly presents key aspects of Michael's life and career and links them to main historical and cultural events, such as famous battles he fought and, more notably, the Council of Ferrara-Florence of 1438, to which Michael's ship escorted the Byzantine imperial convoy. Details from accounts of other mariners and travellers who journeyed on the convoy are used to shed light on Michael's experience and immerse the reader in a fifteenth-century mariner's world. The last part of the chapter links the contents of the manuscript to the hybrid cultural context in which Michael operated. It sheds further light on cultural and religious aspects of the Rhodian officer's life and discusses various questions presented by the manuscript and further tackled by other contributors in the following chapters. In this sense, Long's introduction nicely sets up the scene for the following more specialized studies. I personally found this chapter carefully researched and annotated, yet at the same time accessible, compelling, easy to read, and full of illuminating insights, parallels, and links with other Renaissance figures, ranging from obscure late Byzantine travellers to famed Italian humanists, such as Nicholas of Cusa. Unlike Long's introduction, most of the following chapters are unlikely to sustain the continued attention of the "general public." The casual reader will probably feel overwhelmed by the degree of detail provided in Alan M. Stahl's meticulous biography of Michael of Rhodes (currently, the most complete source of information about this author), by parts of Raffaella Franci's accurate study of the mathematics in the manuscript, or by the technicalities of shipbuilding detailed in David McGee and Mauro Bondioli's chapters, and so on. By contrast, specialized scholars will find all these contributions reliable sources of precious information. Historical geographers and map historians will find Piero Falchetta's chapter on the manuscript's portolan of particular interest. The portolan contains instructions for the coastal navigation of Atlantic Europe, the Gulf of Salonika, and the Adriatic--coasts Michael had more or less extensively sailed. Having contextualized Michael's portolan within a much broader (yet rather understudied) tradition of periploi (ancient Greek and Byzantine lists of ports, villages, and cities as encountered during a coastal journey), Falchetta shows how Michael's portolan had been copied from another source (like most of the rest of the manuscript). He also shows how the portolan contains a number of technical errors, which go beyond mere transcription and would have made the portolan totally impractical, if not deceitful, for navigational purposes. Falchetta concludes that the utility of the portolan was symbolic, rather than practical. It was the possession of certain "work instruments" (such as the portolan and other sections of the manuscript), rather than their actual content, that "certified the nautical experience of their proprietors, as the proof of the fact that they could have access through their libro (book) to specific knowledge" (vol. 3, p. 205). In other words, Michael's manuscript was less of a practical aid than an object used to instruct and impress potential patrons and employers who were not necessarily familiar with the art of navigation and its technicalities. As the other studies in the volume show, this thesis seems to be confirmed by other parts of the manuscript. For example, the place of mathematics in Michael's manuscript, Franci suggests, often appears to be more "recreational" than practical (in the literal sense). Copied from contemporary abbaci (or school textbooks), problems, exercises, and much of Michael's mathematical writing have nothing to do with his own personal needs as a sailor (vol. 3, p. 145). Similarly, the manuscript's section on the zodiac, Dieter Blume shows, contains some basic astrological mistakes, whereas the treatise on shipbuilding, we read in chapters 7 and 8, was not all Michael's work. Here, Michael once again reveals his importance as a collator and transmitter, rather than as an authority on the matter (it is worth noting that did not himself build ships). The price of the set does certainly justice to its publishing standard and the quality of the writing (both in terms of translation and research). Beyond the sheer delight of a high-quality facsimile, the book is a pleasure to read simply for its rigorous accuracy and careful detail. The editors' work has been truly commendable. Long, McGee, and Stahl certainly succeeded in "fixing" the contents of this extraordinary unedited manuscript for posterity, preventing them from getting lost a third time. May The Book of Michael of Rhodes serve as an inspiration and example for publishers, private collectors, and scholars.